Readers of Conservation Value Notes know that I'm an enthusiast of Better Place electric vehicle battery systems. Running low on charge? Instead of having to plug in my electric vehicle (EV) for hours to recharge, I can simply pull into a battery swap station. In minutes, I'm driving out with a fully-charged battery! I can envision how battery swapping capability might offer ways around the range limitation of electric vehicles, a key factor holding back peoples' trust in them as everyday cars. Let's say I need to drive to Tahoe for a ski weekend in my Better Place-powered EV. If my limited-range spare battery (which I keep in the trunk) is not enough to get me there, I simply rent an extra battery or two (and maybe a portable overnight charger), and I'm good to go! There's another a business opportunity (and an entire service sector) that could come out of the EV industry -- in the emerging paradigm detailed in Lisa Ganskey's The Mesh. Even better? How about if my house is powered by a solar electric system and Better Place offers a home back-up power supply in which the batteries are compatible with my EV? They can therefore double as extra batteries for road trips! Heading out of town for a camping trip in a wilderness up near Mt. Shasta? I simply pull one or two of the batteries out of my Better Place-compatible home back-up power supply and toss them in the trunk. Granted, I have no idea how near or far Better Place actually might be from this vision. I'm just pondering the possibilities of swappable EV battery technology. What do you think -- which battery system is going to win in the emerging world of electric vehicles? 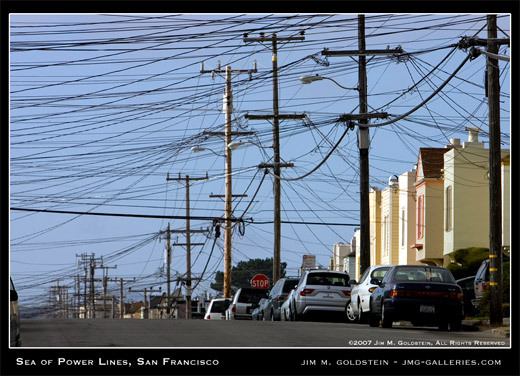 Have you ever walked down the street and gotten just a little bit disgusted by the sheer ugliness of the power grid? Powerlines dangling everywhere, trees hacked away to make room for dangling wires that inefficiently connect our homes to a power plant that is often tens or even hundreds of miles away. This is one of many reasons my eyes brighten at the thought of mass deployment of distributed energy -- putting a solar electric and hot water system on every house and building. As I like to say, "empty roofs = wasted space." Just think of the tens if not hundreds of millions of acres of empty roof tops out there waiting to be tapped for their energy potential, from homes and apartment buildings, to office buildings, shopping malls and Wal-Marts. China has the world's fastest supercomputer, the fastest high speed trains and is leading the world in building nuclear plants. One of its more remarkable achievements has been modernizing the grid. The country has developed a 1 million AC volt transmission line that loses only 8 percent of its power on a 1,200 mile journey from the power plant in western China to the cities in the east. An equivalent U.S. line, with only 760 kilovolts, would lose 80 percent of its power. So we destroy ecosystems to mine and smelt megatons of copper to manufacture powerlines that do their job so inefficiently that the majority of fossil fuel used to generate electricity goes to waste. In effect, we're creating much of our heat-trapping and lung-sickening pollution for nothing, and are wasting untold $$billions in the process. How might we view this glass as half-FULL? Where there is waste (in the form of pollution), there is an opportunity to improve efficiencies of resource and energy use, cut costs and straight-up make things better. It's time to bring America's electricity generation system into the 21st century, not only via a massive deployment of clean energy infrastructure, but with a complete overhaul of our power grid. Do you know, off the top of your head, how much more efficient EnergyStar-certified appliances and electronics are compared to their conventional counterparts? Would you be disappointed to learn that on average, it only means about 20% more efficient? How can you find the most efficient Energy Star products - the ones that will help you obliterate your home energy bills and carbon footprint alike? "The Most Efficient standards for refrigerator/freezers require them to be about 30 percent more efficient than standard models and the TV requirements call for 80 percent more efficiency than common products on the market, the EPA said. The lure of slapping "Most Efficient" on products is also intended to act as an incentive to companies to step up the efficiency of their products to make them stand out from the crowd. Out of the 1,800-plus refrigerators and freezers that carry the Energy Star label, only 15 are considered Most Efficient. And 18 televisions out of the 1,400 Energy Star TVs are called Most Efficient. Props to EnergyStar for making it nice and simple to access the "A List" of products it certifies to be energy efficient. The quicker and easier it becomes to find this money-saving information and to tell your friends how to find it, the more people will do so. Simplicity is, after all, one of the key pillars of "sticky" ideas. Click here to find the absolutely most efficient Energy Star-certified washers, refrigerators, televisions and heating/cooling systems. A few years ago when I visited Caye Caulker in Belize, I was appalled to learn that the island burns dirty diesel fuel to generate its electricity when the weather is either sunny or windy or both almost all of the time. I just got back from Cabo San Lucas at the southern tip of Baja, Mexico and I'm sorry to report the same type of gripe with this resort community (though I don't know whether they generate electricity specifically via diesel fuel or via Mexico's other mostly dirty or land-altering sources). In Cabo's hot climate, resorts have air conditioning blasting in virtually every occupied room 24/7. Yet there is nary a solar panel or wind turbine to be seen (aside from one isolated green housing community that a hotel manager told me about when I asked her why they don't use solar). What a waste of expensive, dirty fossil fuels that generate huge amounts of heat-trapping carbon pollution. Could there be a significant missed business opportunity here -- both for Cabo's resorts to cut their long-term energy costs and for major solar companies to secure lucrative qualified sales leads? One that comes to mind stems from resort owners' aggressive sales of time shares to pretty much all vacationers. For example, we hadn't even left the lobby after checking in before a time share salesperson stopped us, offering the "all inclusive" meal/drinks plan for $40/day instead of the normal $77. After talking it over with my wife, we decided to take them up to secure the savings they were offering. For good measure, I also negotiated in a 50 minute massage for my wife and one for myself, and another $50 in benefits. All we needed to do to secure these perks was visit another resort (which we wanted to check out anyway) and take the 1.5 hour time share tour with their sales associate, who we knew would offer an aggressive sales pitch to buy in. We took the tour with a very nice Canadian gentleman, enjoyed our free private taxi rides and Mexican breakfast buffet, declined the timeshare pitch, and walked away with $500+ in perks. From the standpoint of a conservation scientist, I was more than happy to let a $billionaire real estate developer subsidize our vacation. That said, what if the sales associate also offered us a major discount on a home solar installation -- one that was almost too good to turn down? What if in exchange for resorts marketing a solar company's services to vacationers, the solar company would provide them with rooftop and on-site solar electricity and/or hot water installations? This type of arrangement could dramatically cut resorts' huge electricity costs and carbon footprints. Another way the resort industry could approach this type of clean energy program is to generate qualified sales leads that it could then sell to vacationers' local solar providers in exchange for money or services. Certainly there are ways to refine this idea, but you get the gist. What do you think -- why should all these tropical resorts, located in hot, sunny climates in windy coastal locations, NOT be getting their electricity from local solar and/or wind installations? It seems that almost anytime a traditional media story covers an "environmental" issue, the environmental solution is framed as "VERSUS" the economy. We hear statements such as, "environmental issues are the last thing the public is thinking about during a difficult economy." Or "policy solutions for a healthier environment face increasing political resistance in Washington as leaders from both parties focus on ways to create jobs." It's as if these people are stuck in a 20th Century bubble. “The Road to Clean Air” is a new report by the American Lung Association in California showing that California could avoid $7.2 billion in health and societal costs and reduce all major air pollution-related health impacts by 70 percent if the state adopts a strong set of new passenger vehicle standards, which are being drafted now. We find robust evidence that ozone levels well below federal air quality standards have a significant impact on productivity: a 10 ppb decrease in ozone concentrations increases worker productivity by 4.2 percent. More and more, we are realizing that the solutions to our environmental problems are also solutions to the great economic, health and quality of life challenges of our times. Could our energy choices moving forward be any clearer? Fossil fuel prices are climbing. They are uncertain. It's really no fun having our transport system stuck on oil. It's increasingly scary, actually. The truth is that in addition to cutting pollution and reducing our dependence on oil imports, renewable energy has a major advantage over fossil fuels: sharply declining prices over time. The price of solar energy production, for example, has fallen dramatically as the industry has gained new economies of scale. A recent request for proposals by Southern California Edison (one of the largest investor-owned utilities in the country) found that solar power is already among the cheapest ways for them to generate new electricity. America's economy is chained to the sinking ship that is the 20th Century fossil fuel economy. Do we really want to stay on the sinking ship of dependence on oil and coal? Or do we want to break free from these shackles and jump on to the rescue ship -- the 21st Century Clean Energy Economy -- that will take us to the destination we all want: the next great era of prosperity..? As a conservationist first and foremost, I'm all in favor of agricultural advances that help stem the devastating impacts of farming and ranching on biodiversity and ecosystem services. We badly need to deploy new farming methods and crop strains that enable humanity to produce more food on less land, using much lower inputs of synthetic fertilizers and pesticides. Importantly, some of the most intriguing approaches I've learned of, such as The Rodale Institute's 30-year farm system trial and The Land Institute's work toward perennial crop varieties, also boost the resilience of our agricultural system to climate change. When it comes to genetically modified crops, however, my sense as a scientist is that we don't know enough about GMOs' long-term health or environmental impacts to know whether these things are really ready for prime time yet. What we do know is that GMOs are not acutely toxic to eat. That is, we know that if you dine on a burger made from cows gorged on GM corn and soy, French fries cooked in oil from GM cottonseed, and soda laced with high-fructose syrup from GM corn, you're not likely to keel over in agony. Tens of millions of people do it every day. But what about more subtle, long-term effects -- problems that public-health professionals call "chronic"? Here we enter less certain territory. With our highly processed diets largely deficient in fruits and vegetables, Americans have high and rising rates of chronic diseases like obesity and heart disease. Meanwhile, food allergies, autism, and non-alcohol-related liver disease have rocketed. It's highly plausible that GMOs, which have existed in our diets for less than a generation, have emerged as another of many contributors to such long-term conditions. So GMOs could theoretically be unsafe to eat. What does science tell us about the matter? Unfortunately, not much. It seems that the body of research in this area lacks depth of credibility due to the intense secrecy of GMO makers. That is, the literature is dominated by findings of agricultural industry-funded scientists, and needs more contributions from independent scientists (who I'm sure would be glad to sign fairly worded non-disclosure agreements or "NDA's"). So where does all of this leave us? Obviously, in need of much more independent research. In April, a bit more trickled out from Quebec, Canada -- and again, the results are unsettling. The study, published in the journal Reproductive Toxicology, focused on corn engineered to possess a trait from the bacteria Bt, which is toxic to a range of insects. So-called Bt corn is extremely common in the United States; according to the USDA, upwards of 60 percent of corn planted here has it. Since its introduction in the '90s, its maker, Monsanto, has insisted that Bt corn must be safe, because the toxin embedded in it cannot survive the human digestive system. The Quebec study (here's the abstract) casts serious doubt on that bedrock assumption. Researchers checked blood samples of 39 pregnant women and 30 non-pregnant women for the presence of the toxin. None were exposed directly to Bt, but all had conventional diets. The results: The Bt toxin showed up in 93 percent of pregnant women and 80 percent of their fetuses. It was also present in 69 percent of non-pregnant women in the study. So, 15 years after the introduction of GMOs, we know that they pose no threat of immediate, spectacular harm. That is, they won't kill us suddenly. Whether they're killing us slowly -- contributing to long-term, chronic maladies -- remains anyone's guess. Well that certainly doesn't sound like a crop technology that is ready to be approved for our food supply, does it? My wife is pregnant with our second daughter, and these kinds of findings indicate to me that our Food Safety regulatory system is dropping the ball in a big way here. Or at the very least is jumping the gun on GMO safety, likely due to intensive political pressures influenced by the Monsanto's of the world. I hope, for the safety of our children and ourselves, that we aren't looking at a very expensive agricultural, health and environmental catastrophe in the making. What are your thoughts on GMO safety? What's the best way to grow more food on less land, using lower inputs of synthetic chemicals and fertilizers?